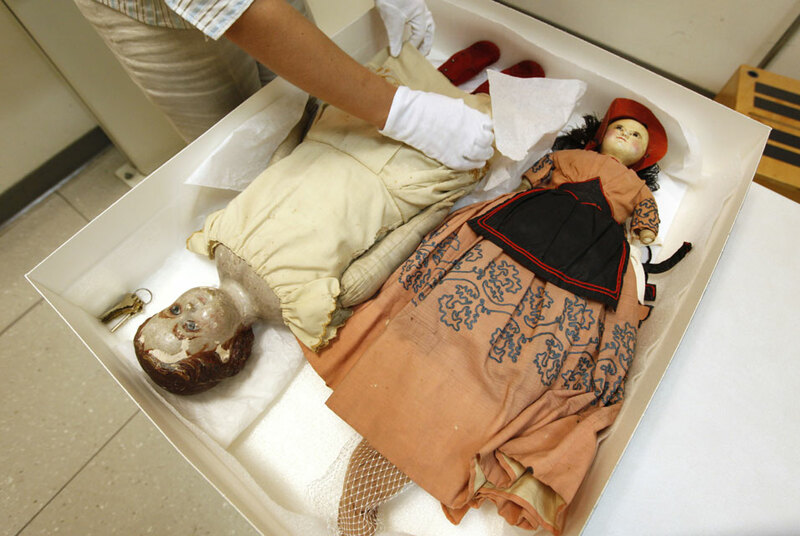 Nina and Lucy Ann are Civil War-era dolls, part of the enormous collection of Civil War artifacts at Richmond’s Museum of the Confederacy. As innocent as they seem, they’ve long been thought to have a dirty little secret: the were used to smuggle medical supplies past the Union blockade to Confederate troops. Their undercover activities haven’t ever been confirmed, so museum collections manager Catherine M. Wright took Nina and Lucy Ann to the VCU Medical Center to get X-rayed. Registered technologist Lanea Bare gently placed each doll on the X-ray table, taking images of each facing up, then on their sides. 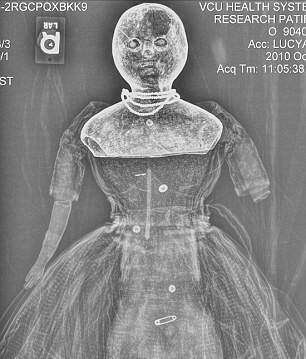 Ghostly images were then displayed on a screen in the busy radiology department, drawing stares and wisecracks from passing doctors and technicians as the dolls lay neatly back in their box. The dolls’ heads and shoulders are stitched to the bodies, which are stuffed with wool or cotton. 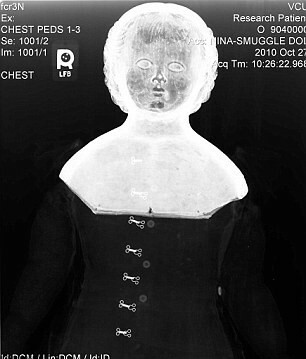 Safety pins used to secure their clothing, including undergarments, were visible in the X-rays. In the article Wright seems to be suggesting that the hollow busts alone are confirmation that the dolls were used for smuggling, but they’re just the most recent link in the chain. First there’s the ownership record. The children of Gen. James Patton Anderson, commander of the Tennessee Army of the Confederacy, donated Nina to the museum in 1923. They told museum officials at the time that she was a smuggling doll. Lucy Ann was donated in 1976 by someone who wished to remain anonymous. He too told officials that the doll was used to carry medicines past the blockade. She also has a gash on the back of her head, possibly received when someone opened her up to get her cargo. Nina is intact. Museum officials think she may have been taken apart and stitched back together for reuse. Both of the dolls are most likely not of American manufacture. There was no doll industry in the US until after the Civil War. Only rag dolls were made locally. Nina and Lucy Ann have papier-mache torsos stitched to stuffed cotton bodies, so they were probably purchased in Europe, packed with quinine or morphine, and smuggled past the Union ships blockading Confederate ports. The idea was that even if the smugglers were boarded by Union troops, inspectors wouldn’t bother searching toys for contraband, at least not thoroughly enough to get to the contents of a doll’s head. Quinine was desperately needed. Almost a million Union soldiers contracted malaria, and although there are no statistics for Confederate troops, malaria was probably even more widespread in their ranks due to their chronic shortages of food and medicine. Most victims survived only to get it again the next year.